Note: all images courtesy of BMW. BMW is pleased to announce the latest BMW i3 including the first ever BMW i3s, as part of the BMW i portfolio which entails the most awarded models in the automotive history. The BMW i3 is the bestselling compact battery-electric vehicle in the premium compact segment worldwide since it was launched in 2014. The design of the new BMW i3 and the exclusive first-ever BMW i3s has been altered to enhance the sporty, urban built yet elegant design of the model. Featuring a wider track, wheel arch molding and design lines that are vastly horizontal, the 2018 BMW i3 models have morphed into a versatile, urban, innovative efficiency mobility vehicle. For the first time, BMW also offers a more powerful and sportier version of the BMW i3 - the BMW i3s, which can also be equipped with a Range Extender. The 2018 BMW i3 and BMW i3s will celebrate their world premiere at the International Motor Show (IAA) in Frankfurt in September 2017 with pricing being announced closer to market launch. 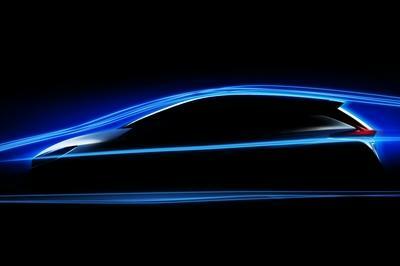 Electric Driving: A new era of mobility. The BMW i3 leads the way to a new era of mobility. It is recognized worldwide as a symbol of technology, sustainability and intelligent connectivity in the urban traffic environment, which is why it has become the best-selling electric car worldwide in the premium compact segment. The recipe for success of the BMW i3 has been enhanced thanks to refreshing styling accents, cutting-edge equipment features and new digital services, but also to the addition of a new model variant – the first ever BMW i3s. Keeping with tradition, the 2018 BMW i3 models will also be available with a Range Extender. 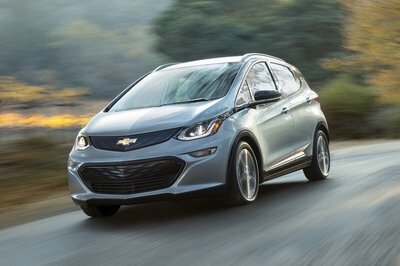 By offering premium-quality, all-electric driving experience, meaning zero emissions and performance, in combination with the latest available connected technology, both model variants represent the future of urban mobility. The BMW i3 has been the top-selling premium electric car in its class since 2014 worldwide. It is not just the visionary electric vehicles and inspirational design that help to make BMW i so popular, but also its innovative mobility solutions and the revolutionary new form of premium character, with sustainability as a key defining element. The BMW i brand has established itself as a pioneer for forward-thinking mobility by offering such products while also adopting an all-embracing approach that takes into account the complete lifecycle, from raw material production, through the manufacture and operation of the vehicles to their later recycling. Emission free mobility and performance. The BMW eDrive technology enables drivers to enjoy emission-free mobility with instantaneous power delivery, efficient use of energy and an optimized range for everyday practicality that even extends beyond the demands of purely urban travel. The BMW i3 and the more powerful BMW i3s draw their energy from the lithium-ion high-voltage battery developed by the BMW Group with a cell capacity of 94-ampere hours (Ah). BMW driving dynamics with instantaneous torque. The agile handling characteristics of the BMW i3 have been optimized with the improved Dynamic Stability Control (DSC) system. This comprehensively revised, faster responding Traction Control system guarantees confident handling under all driving conditions. Traction in less than ideal driving conditions has also been noticeably improved. Dynamic Traction Control (DTC) mode now boosts agility at higher speeds and during sporty cornering, even allowing mild and safely controllable drifts when grip levels are reduced. The synchronous electric motor powering the new BMW i3 generates a maximum output of 170 hp. 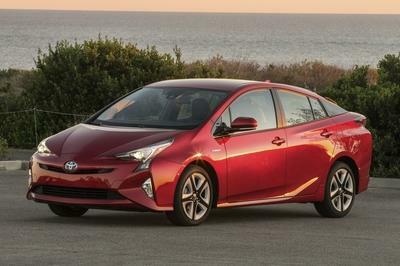 Its peak torque of 184 lb-ft is available instantly from standstill, in typical electric motor fashion. This means that stepping on the accelerator pedal immediately unleashes a thrilling burst of speed. The motor smoothly delivers the kind of performance that drivers expect from a BMW via a single-speed automatic transmission, with continuous power delivery that builds up the car’s speed. The new BMW i3 accelerates from 0 – 60 mph in 7.2 seconds1 with an electronic top speed of 93 mph. The first ever BMW i3s: a thoroughly dynamic performer. The first of its kind and more powerful BMW i3s incorporates a number of design elements all of its own that highlight its particularly dynamic character. Both the front and rear aprons are notable for their model-specific, powerfully shaped contours. At the front, the bumper inlay and its U-shaped surroundings are in black finish. The front fascia’s side sections are bordered on their lower edge by accent strips in BMW i Blue or Frozen Grey that emphasize the width of the car, complementing the front fascia. The accent in the closed BMW kidney grille is also painted in high-gloss black to give the grille a more prominent appearance. The rear apron of the first-ever BMW i3s is likewise composed of individually styled contours, while the black surround frames an extra-wide, body-colored inlay. On the first-ever BMW i3s, the roofline accent also sports the same high-gloss black finish as the A-pillars. Underneath all of the design elements, the first-ever BMW i3s features a sports suspension that includes a 10-millimeter drop in height. Visually broader high-gloss black wheel arch moldings’ emphasize an increase of 40 millimeters track width compared to the BMW i3 providing a stable stance and sportier looks. The BMW i3s comes standard with exclusive 20-inch light-alloy wheels in bicolor double-spoke design, which are ½-inch wider than the previously available. Customers can also specify these wheels in Jet Back finish as a no-cost option. Overall, the first ever BMW i3s is the most powerful BMW i3 to date with clearly reflected key design elements that highlight its sporty character. 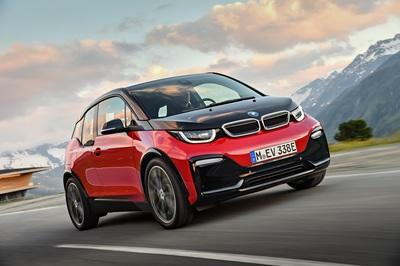 New high-performance motor and SPORT mode for BMW i3s. The first ever BMW i3s provides an even sportier interpretation of silent mobility with zero emissions and features a high output 184 hp1 electric motor that generates peak torque of 199 lb-ft1. Its updated drive system includes modified motor control and specific taper roller bearings, which have been utilized to optimize power delivery and the performance curve at higher rpm. At the limits of the motor speed range, the power and torque of the enhanced drive system represent an improvement of up to 40 percent over the BMW i3. The driving dynamics and enhanced e-Driving abilities are significant especially at higher engine speeds when higher performance and higher torque is more noticeable. The first-ever BMW i3s features a sports suspension with specially developed springs, dampers and anti-roll bars. Drivers can now also select SPORT mode using the Driving Dynamics Control switch. This initiates more direct accelerator response and tighter steering characteristics to accentuate the car’s sporting edge. Just 6.8 seconds1 is enough to see the BMW i3s burst past 60 mph on its way to a top speed of 100 mph1. A two-cylinder range extender gasoline engine is available as an option for all BMW i3 models. The engine drives a generator that produces power as required to feed electricity to the high-voltage battery, which becomes available whenever necessary. This extends the car’s overall range in everyday use by 87 miles1, increasing it from around 97 miles1 to a maximum of 180 miles1. Design accents: A sporty yet elegant look. The unmistakable, avant-garde exterior styling of BMW i3 has already picked up the iF Gold award for product design and the World Car Design of the Year award along with other accolades, and it has now been enhanced by a number of design touches that clearly convey the sporty and stirring driving experience on offer. The trademark BMW i Black Belt, running from the trunk over the roof to the car’s rear end is now complemented by A-pillars and rooflines that also sport a black finish. In contrast to the BMW i Black belt, two new exterior paint colors Melbourne Red metallic and Imperial Blue metallic compliment the vehicle design. Besides these two new additions, customers can also choose from the non-metallic shades Capparis White and Fluid Black as well as Protonic Blue metallic and Mineral Grey metallic. A matte-chrome roofline accent on the BMW i3, as part of the black A-pillar and roof layer, add a touch of elegance. This design element also improves height perception, adding to the models stance as it widens towards the rear. The restyling of the front and rear aprons places particular emphasis on the car’s width. The redesigned front contour highlights a wider stance with athletic characteristic. A chrome-design trim strip running across the full width of the rear and the positioning of the model and eDrive badges on the outer edges of the tailgate serves to reinforce this impression. The new BMW i3 and the first-ever BMW i3s come equipped with Full-LED headlights as standard, which employ LED bulb units for low and high beams, as well as the daytime running lights. The new turn signal indicators also feature LED technology and are integrated into the front apron in the form of horizontal strips. This means that LEDs are now used for all lighting functions at the front of the vehicle too, as was already the case with the glass-covered rear light assemblies. The new design elements highlight the enhanced character to emphasize a strong presence and sportiness. The BMW i3’s strong character is enhanced by the U-shaped feature line in matte black in the bumper. The horizontal LED indicators emphasize width even more. The rear shows off, the powerfully molded contours and the contrast in color between the black surround and the body-colored inlay. Like the exterior design, the interior styling of the new BMW i3 and first ever BMW i3s is rooted in the LifeDrive vehicle architecture. The carbon fiber-reinforced plastic (CFRP) passenger cell has a wonderfully spacious feel about it and is dominated by a sense of lightness. The design principle of the two four-seater models means there is no need for either fixed B-pillars or a transmission tunnel. Doors that open in opposite directions allow the occupants to get in and out with the greatest of ease. The Mega, Giga and Tera World equipment lines are available for the new BMW i3 and first ever BMW i3s as alternatives to the standard Deka version. The optional Giga World includes a new trim for the seat surfaces in Giga Brown Natural Leather & Carum Spice Grey Wool Cloth which combines natural leather tanned using an olive leaf extract with a wool-based textile material. The BMW i3 and BMW i3s apply the concept of sustainability throughout, as other materials used are recycled plastics, renewable raw materials, natural fibers and open-pored, unbleached eucalyptus wood. Over 80 percent of the surfaces visible to the passengers are made from recycled materials or renewable resources. The available seat belts in BMW i Blue for the first ever BMW i3s only, provide a splash of color in the interior. Typical BMW i Brand lettering are also visible on the front floor mats. Technology and Driver Assistance Systems. The driver assistance systems available for the new BMW i3 and first-ever BMW i3s ease the driver’s workload and provide support in various traffic situations, as well as helping with longitudinal and lateral vehicle control. 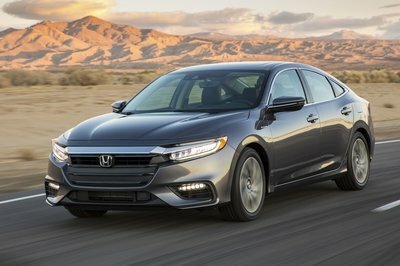 The Technology and Driving Assistance Package offers Active Driving Assistant and Active Cruise Control with Stop & Go while Advanced Real-Time Traffic Information and ConnectedDrive Services are also contained within the upgraded Navigation System included in this package. When equipped with the Technology and Driving Assistance Package, Apple CarPlay can be enabled. Park Distance Control is a standalone option as well as the Parking Assistance. Once the system has been activated and a suitable parking space has been found, at the press of a button Parking Assistant takes control of acceleration, braking, gear selection and steering. Driving Assistance systems also contained within the Technology and Driving Assistance package include Daytime Pedestrian Protection, Frontal Collision Warning with City Collision Mitigation and Speed Limit Info. The latest BMW iDrive 6 interface, ConnectedDrive with navigation features and On-Street Parking Information specially developed for electric mobility. Both the new BMW i3 and first-ever BMW i3s come with the latest version of iDrive, which provides an intuitive interface for controlling numerous vehicle, infotainment, communications and navigation functions, specifically designed for BMW i. In vehicles equipped with the Navigation system Professional, the Control Display features a 10.25-inch screen with an increased resolution of 1,440 × 540 pixels. The main menu is presented in the form of live tiles containing dynamic content. The voice recognition system has also been optimized with cloud-based off-board processing of speech. With Natural Language Understanding available with the Navigation system Professional, spoken instructions can now be executed more quickly and naturally, i.e. when searching for an address or Point of Interest, or for searching music and phone numbers or dictating e-mails and SMS messages. Natural phrases such as “find coffee shops nearby” or “take me home” make for an effortless experience. When equipped with Apple CarPlay, additional smartphone apps can be seamlessly integrated within the vehicle’s operating system. The enhanced BMW i ConnectedDrive offering ensures intelligent connectivity through services specially tailored to electric mobility. The On-Street Parking Information search service, now available for the first time in the BMW i3, can also be used alongside the Advanced Real Time Traffic Information (ARTTI) system with the optional Navigation system Professional. On-Street Parking Information helps drivers locate available parking spaces in many major US cities. It uses historical and real-time data to determine the likelihood of finding vacant parking spots in a given area and displays the information on Navigation Map. Specifically designed for BMW i, public charging stations and information about their availability can also be displayed on the navigation system’s map. When route guidance is activated, data about the route is also used to calculate the range shown in the instrument cluster as accurately as possible. Standard on the i3, the range map provides a visual representation of the current operating radius. With Navigation Professional, the dynamic range map draws a boundary representing the maximum range the vehicle could travel on its current charge status. It is also possible to display the different ranges achievable in each of the Driving Dynamic Control modes. BMW i-specific navigation features also include intermodal route guidance. This helps users to quickly and efficiently reach their destination by factoring in local public transport timetables and connections. Regular, automatic updates of the navigation data are now also provided “over the air” in the BMW i3, using a mobile network connection. A package of new services were introduced in early fall under the BMW Connected+ umbrella which enable a highly personalized digital experience. All of the digital services related to BMW Connected and BMW Connected+ will be available in the BMW i3 and BMW i3s. These span intelligent route planning, including stops at charging stations or gasoline stations in the case of the range extender (Send my Routes to Car), sharing of the car’s current location via SMS and live link (Share Live Trip Status). Also part of the Connected portfolio features personalized display of relevant in-car information (BMW Onboard), seamless transfer of route instructions to the customer’s smartphone or smartwatch once the car is parked (Navigate Door-to-Door) and direct syncing of contacts and addresses to the navigation system (My Destinations). BMW Digital Charging Service enables convenient and intelligent charging. Planned for release in the first-half of 2018 is the BMW Digital Charging Service. BMW ConnectedDrive and the BMW ConnectedDrive Portal will turn charging into an easy to use digital experience. As a result, the BMW i3 and BMW i3s are integrated perfectly into the customer’s smart ecosystem. The service’s ease of use – from a smartphone via BMW Connected or from PCs and tablets via the BMW ConnectedDrive Portal – also facilitates fully transparent, sustainable use of renewable energy. With the introduction of its unique BMW Digital Charging Service, BMW becomes the world’s first carmaker to integrate electric mobility with its customers’ digital worlds. 360° ELECTRIC is a range of products and services that help make electric mobility a convenient, everyday experience. The functionality of the standard charging cable supplied with the first ever BMW i3s has been optimized and includes a temperature sensor. Charging at home is extremely user-friendly thanks to the BMW i Charging Station which can supply 7.2 kW of power to charge the high-voltage battery. This allows enough energy for an electric range of around 90 miles to be transferred in three hours – about five times quicker than with the standard Level 1 120 V charging cable. Drivers with a registered ChargeNow card have unrestricted access to the world’s largest network of public charging stations. BMW Original Accessory: BMW TurboCord™ EV Charger. Now available as a BMW Original Accessory the BMW TurboCord™ Electric Vehicle Charger can be purchased at certified BMW Centers for $499 MSRP. This premium charging solution provides BMW i and BMW iPerformance drivers with the ultimate charging experience – flexible dual-voltage (120 V / 240 V) capability and nearly three-times faster charging – all in the smallest, lightest UL-listed portable charger available. The BMW TurboCord™ EV Charger components have been specifically engineered by BMW to meet BMW Group standards and requirements, featuring a convenient 20 ft charging cord, and provides two chargers in one. Level 1 charging is readily available when plugged into any 120 V outlet and it also allows customers to charge up-to at 3.6 kW, nearly three-times faster than the standard occasional use cable (OUC) when used with a 240 V outlet (NEMA 6-20). Also integrated are such state-of-the-art safety features as unit and plug temperature monitoring, automatic shut-off and a rugged, waterproof, submersible enclosure (NEMA 6P) that enables users to safely and reliably charge indoor and outdoor. BMW i is shaping the future of sustainable personal mobility. Its integrated concept focuses on responsible use of resources and incorporates material selection and innovative mobility services alongside emission-free driving. The BMW i3 is just as serious about the fun of driving, turning even a trip around town into an electrifying experience. The inspirational design of the BMW i3 expresses a new style, while the instantaneous power from the drive system provides an inspiring showcase for the dawn of a new era in mobility. This car’s architecture was designed from the ground up with electric mobility in mind. Combining the latest technological innovations with an evolutionary development of the car’s design and the expansion of the model range has provided additional impetus for BMW’s now familiar take on premium electric mobility. The character profiles of the new BMW i3 and first-ever BMW i3s are focused more than ever on driving experience, which gives them all the ingredients required to strengthen their leading position in e-mobility and the BMW i success story.